US Republicans are a conservative party, but even just two decades ago they were pro-science, generously funding many of the nation's greatest science programs like NASA. But not anymore. 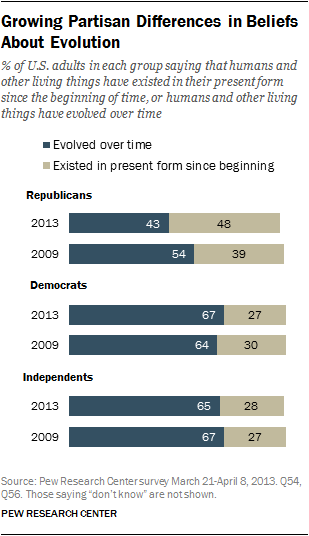 Now, a new Pew survey shows that only 43% of Republicans believe in evolution. What is public science, and why do you need it? It may, however, be possible that people who believe in evolution may have stopped identifying as Republicans as the party has become more closely aligned with religious interests. Here, you can see these beliefs broken down by religious affiliation. The most conservative groups by far are white evangelical churches, followed by black protestant churches. The vast majority of white evangelicals believe that humans have always existed in their present form, and never evolved. But this anti-science bent to the Republican party may be generational. In the same survey, Pew researchers found that people under 30 are not being swept up into the anti-science trend among conservatives. People under 30 from every party and background are more likely to believe in a scientific version of evolution.